With five siblings to care for, Prudence Hixsby 's duty comes first, even if it means becoming a spinster. When the eldest—and most cherished—of her younger brothers decides to join the war, however, Prudence is determined to keep him safe. So she strikes a bargain with an old acquaintance: her body in exchange for her brother's safety. In the dead of night, she slips into the bed of a man whose touch is both fierce and passionate... little knowing she's just seduced the wrong man. by Robyn DeHart Copyright © 2014 by Robyn DeHart. All rights reserved, including the right to reproduce, distribute, or transmit in any form or by any means. For information regarding subsidiary rights, please contact the Publisher. Prudence Hixsby, eldest child to the late Mr. and Mrs. Hixsby of Staffordshire, stole a glance at the tall man across the parlor. Harrison Carlisle, Duke of Sutcliffe. He leaned against the mantel as if he owned the room even though he was as much a guest as she. His arrogance was palpable. His lean figure cut a dashing view with his bright white cravat, expertly tied, and his black tailcoat. She looked down on her own dress—meager by his standards, certainly, but it was one of her finest gowns, a soft blue embroidered muslin with a satin ribbon tied just under her breasts. It was a flattering color, she’d been told. Still, in comparison to the duke’s finery, she felt lacking. His shrewd blue eyes scanned the parlor, yet he never seemed to see her. Blast it all, but he was handsome. “You’re staring,” her brother’s voice said from behind. She started at his intrusion. “Johnston, you shouldn’t sneak up on a person in such a way.” She tapped his elbow. “And I was not staring.” Had she been staring? Nearly twenty people were in attendance. She recognized most of them. Lord and Lady Flintlock played cards at a table in the back of the parlor, with two older women whom she recognized, but could not recall their names. Several others chatted around the room as she and her brother were doing. None of them seemed to notice her, so had she been gawking, perhaps it had gone unseen by all but her brother. She ignored his goading. It was alarming, not to mention troubling, that she’d been staring at the duke at all, let alone that she’d been caught. What was it about the man that she found so interesting? It was not his charm; he’d never been particularly friendly to her. “I want to speak with you about something,” Johnston said, interrupting her thoughts. “Jefferson idolizes you,” Prudence said. “Don’t be flippant about this.” Her brow furrowed and she fought to keep her voice low. “War is extremely dangerous. Men are killed every day on the peninsula.” Panic rose in her throat; her stomach churned. He was right, and she knew her brother, once he’d set his mind to something, could not be convinced otherwise. She clenched her teeth and scanned the room. Her gaze fell upon the Duke of Sutcliffe again and she glared at him. Another gentleman had joined him, and they stood together at the mantel, drinking and conversing. She was certain that Sutcliffe was to blame for Johnston’s newfound enthusiasm to join the military. He’d listened intently to Sutcliffe’s stories of the battles he’d fought before coming back to England to head up intelligence gathering. And Johnston wanted to be a part of that. Her breath caught. All it would take was one word from Sutcliffe to change her brother’s mind. She need only appeal to his gentlemanly nature, provided he had one, to ensure her brother stayed out of harm’s way. “You’re absolutely right, dear brother. Enjoy the remainder of your evening.” She nodded, then strode toward the fireplace, fists balled in her skirt. Thankfully the other gentleman moved on before she reached the duke. Confronting the Duke of Sutcliffe would take every ounce of strength she could muster, so she needed to do it now while the panic of war still burned in her gut. “Indeed,” he said, his tone dismissive. “What business does a lady such as yourself have with a rogue like me?” His eyes quickly trailed the length of her, then studied the glass in his hand. His shoulders lifted in a casual shrug. “Your words, not mine. But you are, as they say, on the shelf.” He turned his body away from her, and looked out at the room again. It was a small gathering, a country house party, but that didn’t mean some of the most important families in London weren’t represented. In fact, she and her brother were only invited because they’d been longtime neighbors of Lord and Lady Grant. The weight of his blue eyes nearly buckled her knees. Good heavens but she was a goose. He was merely a man. “I know you are in charge of some elite group gathering intelligence to help with the battles,” she said, refusing to respond to his offer of familiarity, if it was one. He took a step closer to her, leaned down so that his mouth was dangerously close to her ear. “I don’t take kindly to insults.” His whispered words were hot on her skin, making her shudder. She sucked in her breath and completely forgot what she was about to say. Having him this close was overwhelming her senses. She should have known better than to approach him alone. He was a trained soldier, and she had no notion of what that entailed. But he was strong and physically perfect. Perhaps she should not be standing so close to him. “On the contrary, Prudence, I find you utterly compelling.” His voice did not waver, and his gaze locked on hers. Certainly he toyed with her, because he could not possibly be flirting. While he’d always been polite in their interactions, she could tell from his expression and tone that he’d never been particularly fond of her. “It appears as though I need another drink.” He gave her a slight bow. “If you’ll excuse me.” With that, he walked away. The conversation had gained her nothing. He was too distracting with those ridiculously beautiful eyes and chiseled jawline. Good gracious, but she was a goose. She could not forget her brother, though, and this foolish decision of his. Johnston was impressionable, not to mention idealistic. Her own efforts had fallen onto deaf ears, but it seemed unlikely that Sutcliffe intended to join her cause. She would talk to her brother again, but she doubted it would do any good. Though he was more than a handful of years her elder, he flirted with her often, had even gone so far as to suggest they have an affair. She could have found his request disrespectful. Instead, she found it refreshing. So many people patronized her lack of marital prospects, insulting her intelligence by suggesting that if she were just to be patient, she’d make a good match. It was startling that they were able to say such things without grimacing. But Sir Fenton fully recognized her spinsterhood and spared her no lies, and she respected him for it. He was not an attractive man, but his flirtations entertained her. She might be a spinster, but she was still a woman who enjoyed attention from men. “Oh, sweet Miss Hixsby, what could have you so distraught?” he asked. Across the room, several of the guests were engaged in a lively game of charades. He took her elbow and led her over to an empty settee. His sympathetic eyes relaxed her, the tension falling from her shoulders. “My brother is insisting on joining the military and fighting in this war. And caring for my family will be left solely to me. I have no marriage prospects, which is certainly fine by me. I have no time for such frivolities as courtship. But without a partner and, without my brother, I shall most assuredly be alone in the care of my younger siblings.” She gulped in a breath and realized she’d said entirely too much. She dared a glance at Sir Fenton, expecting him to be horrified by her outburst. “I suppose you’re right about that. And there are plenty of other brothers and sons who go off to fight in the war.” She took a deep breath and rounded her shoulders back, forcing herself to sit up. She would not get herself all in a dither about this, not here. “What if I told you that I could put your brother in a position that would satisfy his need to be involved in the fight, but keep him safe here in England?” Sir Fenton asked. Her heart stuttered. “You can do that?” She knew Sir Fenton was involved with the government in some capacity, but she had no notion of his power. And since he was merely a baron, she had not assumed his power was considerable. Irresistible? No man had ever found her irresistible before. Even though she most decidedly did not find Sir Bailey Fenton irresistible, some part of her was tempted. “You are suggesting I prostitute myself in exchange for favors.” She kept her voice low, but it hitched with emotion. There was a kind of grim resignation to his voice. As if he believed he might have to give his life to win this war. Furthermore, he wasn’t complaining. He didn’t expect sympathy. He was merely asking for comfort. In that light, his request seemed almost reasonable. He wanted to have an affair with her, and he’d made that abundantly clear on more than one occasion. But tonight, in light of the situation with her brother, he’d given her a reason to accept his proposition. She genuinely liked Sir Fenton. As a man, not as a potential suitor. He had always been kind to her, had always flirted with her and made her feel sought after, when other men spared her so little attention. Her gaze drifted across the parlor to where Harrison leaned insolently against the wall. Blowing out a breath, she turned her attention back to Bailey. What he was proposing was outrageous…or was it? Was she actually considering his offer? A laugh from across the room caught her attention. The Duke of Sutcliffe chuckled boisterously at a jest his companion had shared. If he had made the same proposition, she would likely have climbed atop him here in the parlor. Well, certainly she could have waited until they were alone. So why was Sir Fenton so different? Because he was less handsome? Less powerful? He had assured her he could keep her brother safe. Certainly her virtue was worth that. It was not as if it was currently serving her any purpose. How could she grow into the eccentric spinster aunt without having some worldly experiences? Harrison lay still in the darkness. A sound had awakened him, and it took him a moment to realize it had been the click of his door unlatching. Someone was in his bedchamber. He reached to the bedside table and retrieved his pistol. He hated these bloody country house parties—they exposed him to too many people. He had only attended so that members of the Seven, the elite group of spies he led, could exchange information without drawing undo attention to themselves. But apparently he hadn’t been discreet enough, because someone was entering his room. He gripped the pistol’s handle and tried to appear as if he were still sleeping. There was movement by his bed, and he wished he hadn’t allowed the fire to die down to nothing but a handful of coals. It wasn’t chilly in the room, but it was unforgivably dark. Then pressure on the mattress as someone crawled in beside him. Soft feminine curves pressed to his bare chest—soft, naked curves. No doubt a servant girl looking for a toss. He sighed in relief and his taut muscles relaxed. She nuzzled closer. He knew that voice, and it was most assuredly not a servant. “Prudence?” he asked in a hushed whisper. Well, she’d better do the talking, because he didn’t understand what the hell she was about. He set the pistol back on the bedside table. Yes, he found Prudence Hixsby undeniably appealing. How could he not with her intriguing curves, her sharp mind, and her straightforward practicality? She was precisely the sort of woman—maybe even the precise woman—he would court, if he was a man in the position to court a woman. But there was no place for romance in his life, let alone marriage, and Prudence was not a woman one romanced without the intention of marrying her. Which was precisely why he’d worked so hard to ignore the attraction he felt for her. Until this very moment, he’d been certain he did such a good job disguising his feelings that she hadn’t a clue that he was attracted to her. Apparently he was less adept at hiding his desire than he’d thought. “Pru,” he began, his voice so rough he didn’t even sound like himself. He should have protested. He intended to but, before he could, she crawled atop him, kissed his chin, and then his jaw. Hot, sweet kisses all the way until she reached his mouth. He had not expected Prudence to seduce him. She seemed so very irritated with him much of the time. Perhaps that was merely her way of flirting. Her chaste kisses were driving him insane. That and the very unchaste feel of her naked skin against his. He was hard. She wanted him. He sure as hell wanted her. He rolled her over and kissed her intensely, taking her sweet seduction and setting it afire. His hand found her breast, and she released a surprised moan. She was plump and deliciously curved against his palm, and he wanted to explore every inch of her body. He cursed himself again for allowing the fire to burn down. He desperately wanted to see her, wanted to see the flush of desire spread across her lovely creamy skin, the pink at the center of her breasts, the dark curls at the apex of her thighs. Her tongue darted out and rubbed against his own, and lust surged hot and wild through him. Perhaps he should attend these parties more often. Her moans of pleasure echoed around him. His hands continued to explore her breasts while he kissed her thoroughly. He reached down and moved a hand up her leg, her skin smooth and soft beneath his palm. His fingers traced behind her knee to the sensitive flesh of her thighs. When he brushed across the juncture of her legs, she released a seductive moan of desire. His own need poured through his veins and settled heavily in his groin. He moved through her nether curls and found her flesh hot and slick with her need. She trembled when his fingers moved against her. She moaned softly. He continued his exploration. He slipped one finger inside her, and slowly he began his rhythm. Her pleasure mounted as he moved his finger within her. He found the nub beneath her folds and stroked across it. Her pleas became erratic. She arched toward him. She was intoxicating. Her body, her touch, her smell. All of her surrounded him and he wanted this moment, this night, to last forever. Closer and closer he brought her to the edge, then he would pull back. He wished he could see her, watch the pleasure play out on her expressive face. She was, undoubtedly, the most passionate woman he’d ever touched. He needed to be inside her. His own desire was becoming increasingly difficult to ignore. So he kissed her deeply. Quickly he guided himself into her before her climax subsided. Oh God, she felt good. Hot and tight and so slick. Her climax started again, and her walls squeezed around his shaft as he increased the depth of his thrusts. “Oh, yes,” she whispered. “Sir Fenton, I had no idea—” her words dissolved into breaths. For a moment Harrison faltered, but he was already inside her and he knew that nothing would stop his climax from coming, even her cries for another man. His release rocked through his body, and he grunted a primal moan and collapsed atop her. Prudence Hixsby had just seduced the wrong man. Harrison stood in the obnoxiously decorated red and gold parlor and glanced around at the faces in the crowd. He’d come to the Blake’s party in hopes of seeing Prudence. Earlier, he had confirmed that she and her brother Johnston had been invited. It had been a little over a month since Harrison had last seen her. Since that fateful night she’d mistakenly crawled into his bed. He still couldn’t reconcile her affections for Bailey—the man was probably twice her age. He knew Bailey; hell, they worked together. Then again, Harrison had never claimed to understand the female mind. Still, she deserved to know the truth about that night. Perhaps she already knew. Perhaps she had seen Bailey and even now, she wondered whose room she’d entered. Either way, Harrison fully intended to tell her precisely that. If he were an honorable man, he’d insist she marry him. But the truth was, she’d endured enough. She’d lost both of her parents and now played mother and father to younger siblings—he never could remember how many there were. She’d endured enough grief, though, so marrying her was not an option, not while his tasks for the Crown put him in such immediate danger. Again he searched the many faces of the people before him. Several members of the Seven milled about, as well as a myriad of other people he recognized from London. They would be entering the dining room shortly, and he wanted to speak with Prudence before they ate, as he planned on leaving soon after. He moved back to the entrance of the parlor, hoping to catch her as she arrived. Fortunately he didn’t have to wait long. Johnston walked down the corridor first, nodded to him, and stepped into the parlor. Prudence followed, striding across the corridor. She walked past him and for a moment stopped. Her eyes shone with anger. Perhaps she already knew, had already figured things out on her own. A flush pinked her cheeks, enhancing her already lovely features. He opened his mouth to speak, but she walked past him, directly over to Bailey. She said something to the man, and the two of them left out the door that led to the corridor. Harrison followed, keeping some distance from them. “I should prefer to speak with you in private,” Prudence said. “This is private enough,” Bailey said with natural authority. “All of the other guests are in the parlor waiting for dinner to be served.” While the man was only a knight, a courtesy title granted to him by the king, Bailey Fenton was a man of means. He was also the liaison between the Seven and the prime minister, so his work for the government was no small task. Harrison inched closer, following them around the corner. They were in a dimly lit corridor that led to the servants’ staircase. Only a handful of wall sconces scattered sparse light about. “I was under the impression that you and I had made a bargain, yet my brother is scheduled to ship out next week,” Prudence said in a harsh whisper. Harrison’s stomach soured. He leaned against the wall behind him, his eyes turned heavenward. He’d always known Bailey was a bit of a lecher, but he figured the man kept his appetites sated with servant girls and the occasional widow. He never imagined the man would solicit a woman such as Prudence. Harrison sneaked a peek around the corner in time to see Prudence bring her hand up to her chest as if to repress her pounding heart. Her skin paled visibly, losing all its lustrous warmth. “What are you saying?” she asked. “Pity. I was very much looking forward to your company.” Then footsteps as Bailey walked away from Prudence, leaving her standing alone in the hall. Harrison nearly stepped out from his hiding place, but what would he say to her? Prudence bit down on her lip and her eyes widened. He watched her clever mind work through the truth behind Bailey’s insinuations. She shook her head and said, “No” again and again. He could nearly read her thoughts, so transparent were her expressions. She had not sneaked into Bailey’s room, therefore she had seduced the wrong man. She had not saved her brother after all. Her shoulders crumpled under the weight of the realization. He felt the burden of it himself. When he’d realized she’d meant to seduce Bailey, her actions had seemed almost incomprehensible. How could such a luscious and enticing creature possibly be attracted to Bailey? The man was a good spy, an excellent leader, and had been Harrison’s own mentor, but one could hardly consider the man attractive to women. Now that Harrison knew the truth, everything made more sense. But the truth was even less satisfying than his confusion had been. Harrison slipped behind a large tapestry hanging on the wall to hide himself as his esteemed colleague walked past. Then he heard a decidedly female sob from Prudence’s direction. He certainly couldn’t tell her the truth now. She was already distraught. But he could do something to assist her. He could prevent her brother from going to fight on the battleground. If Johnston wanted to be part of the war, he would recruit the man to join the ranks of the Seven. It would keep him far safer than the alternative, and at least Prudence’s actions wouldn’t have been in vain. Prudence Hixby has accepted spinsterhood as a foregone conclusion. With her brother, Johnston determined to risk life and limb for Crown and country, and a veritable brood of younger siblings in her charge; chances of finding love seem considerably less than stellar. When the opportunity to save her brother from the ravages of war in exchange for a tryst with the well connected Sir Bailey Fenton, is put before her; Prudence deems the sacrifice of her virtue, a small price to pay to ensure the safety of her brother. Little does she know that her late night wanderings lead her into the arms and heart of a temptation far greater than the one she planned. As fate would have it Johnston, while kept out of the line of fire, dies during service of a stealthier sort. Incensed and fueled by her need for answers about her brother's death; Prudence finds herself on the doorstep of on Harrison Carlisle, Duke of Sutcliffe, known associate of the late Johnston...and her secret crush. Authoress Robyn DeHart presents readers with a delectable feast of colorful characters, complex plot twists, and whodunnit variety intrigue. This story is a step away from DeHart's more societal based romantic plots. With a story that reads more like a Regency-styled "Mr. And Mrs. Smith", the action and espionage alone are enough to keep hearts racing and pages turning. 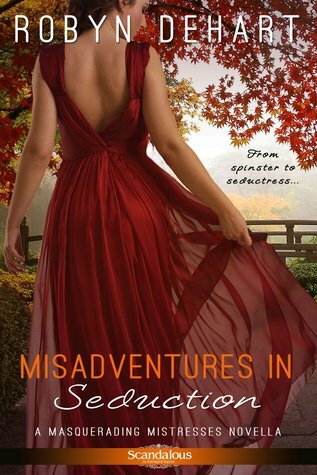 Misadventures In Seduction becomes "must-read romance".